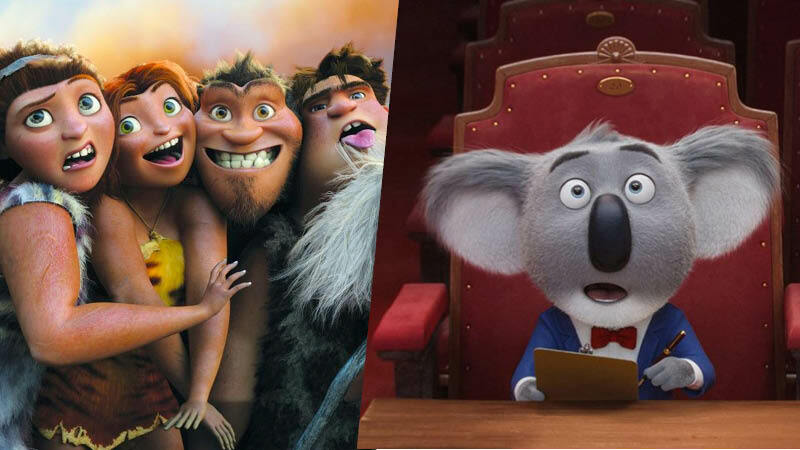 The Hollywood Reporter has brought word that Universal has moved the release dates for the upcoming sequels to both Sing and The Croods, with the musical comedy now hitting theaters in 2021 while the caveman adventure being pushed back two months to Christmas 2020. Sing, which features the voices of Matthew McConaughey, Reese Witherspoon, Seth MacFarlane, Scarlett Johansson, John C. Reilly, Taron Egerton and Tori Kelly, has earned $429.8 million worldwide. Set in a world like ours but entirely inhabited by animals, Sing stars Buster Moon (Academy Award winner Matthew McConaughey), a dapper Koala who presides over a once-grand theater that has fallen on hard times. Buster is an eternal optimist—okay, maybe a bit of a scoundrel—who loves his theater above all and will do anything to preserve it. Now facing the crumbling of his life’s ambition, he has one final chance to restore his fading jewel to its former glory by producing the world’s greatest singing competition. The sequel, which was originally set to hit theaters on Christmas 2020, is now slated to hit theaters on July 2, 2021. In 2013, the world was introduced to the first family of the prehistoric era, The Croods. The Academy Award-nominated comedy about a clan dealing with their changing world captivated global audiences, reminding us of the timeless importance of family… and just how little we’ve evolved. In 2021, DreamWorks Animation invites you on an all-new adventure back in time with The Croods 2. Returning stars Nicolas Cage (Mandy), Emma Stone (Maniac), Ryan Reynolds (Deadpool 2), Catherine Keener (Kidding), Cloris Leachman (American Gods) and Clark Duke (I’m Dying Up Here) have also welcomed Leslie Mann (Blockers) to the film’s cast as the family face their biggest threat since leaving the cave: another family. The development of the film has been a long tormented road, with production initially set for two years after the release of the first film, but release dates continually were pushed back before DreamWorks announced its cancellation back in November 2016. Following Universal’s acquisition of the animation studio, it was announced production had been revived with its new 2020 release date. Though it was originally set to hit theaters on September 18, 2020, the film will now hit theaters December 23 the same year. The post Universal Shifts Release Dates for The Croods and Sing Sequels appeared first on ComingSoon.net.